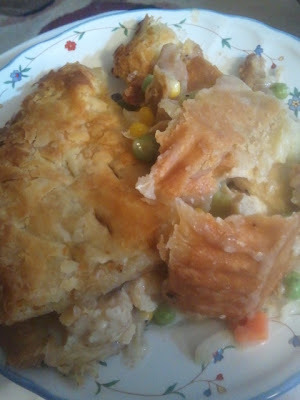 I was craving Chicken pot pie with a puff pastry shell the other day, and Husband made it for me from scratch. I mean he didn't make his own pie crust and used the Pepperidge Farm Puff Pastry Shell on top, but otherwise from scratch and it was dannnnnngg goood! so good I had to share! The only thing different was that instead of topping with a second crust, he topped with a puff pastry shell from pepperidge farm. It was sooo delicious, see below for a pic! 'scuse my Pennsylvania-born Grandfather teaching me that what you have here is "chicken pie." This is VERY doble and I bet that tastes more amazing than a microwave one for sure!